On Saturday my daughter and I walked to the downtown Sarasota Farmer’s Market. It’s a little embarrassing how infrequently I go as the “walked there” indicates just how close it is to our house. In spite of the stifling July heat, it was a lovely morning with my girl. 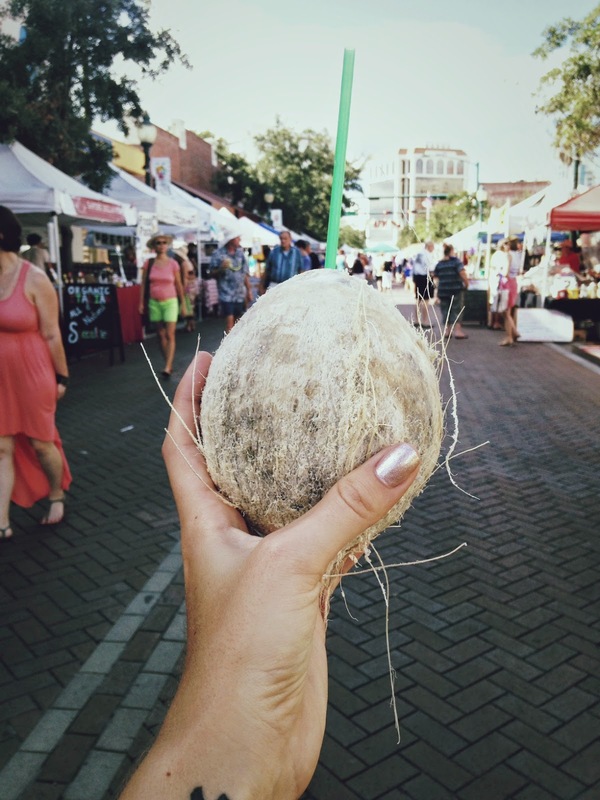 She bought a fresh coconut for $2 and we shared it. This was a first for me. I am not really a fan of coconut, at least not the kind you find unexpectedly in desserts. But I do like the flavor, as in, I’ll have a piña colada, thank you. It was quite refreshing. And it felt hip and trendy and a little touristy to be strolling around sipping out of a coconut. It also fed my inner adventurer because I really try to be open to new things. What makes some people more gutsy than others? For some new things are terrifying. Is it our age? It is how we’re raised? How do we cultivate the courage to step out and try new things when it’s easier to remain in our safe little comfort zones? I am a firm believer in LIVING, and I venture into the unknown whenever I can. Not like skydiving – yet – or a tattoo – yet? But the adventure of trying new things and stretching myself is what I strive for. I’m hoping it will keep me young. My dependence on God really shows when I’m living like this. I become more aware of his presence – and my need for him – when I am out of my comfort zone. He is always God, and that doesn’t change. My life should never be so predictable and routine (and boring!) that I lose sight of my need for him. Sure, changing things up can be a little risky, but I find it fun to explore something new! The next time you’re out grabbing a bite, don’t order the same old thing you always order. Heck, you could go to an entirely different restaurant. There are 898 listed on Yelp for Sarasota alone… that’s enough to try a new place each week for the next 18 years! Experiment with a new hobby, or sample a music genre that’s outside of your norm. I happened across a classical station earlier this year and realized it reduced my road rage during season. And I learned that I enjoy a little Mozart, and less madness while I’m driving.